This post contains a list of all the fairly traded cocoa products I am aware of for sale in New Zealand. To jump straight through to the list, click here. 1.4 million of these children are doing work hazardous to their physical health. Given that 60% of all cocoa in the world is grown in Ghana and the Ivory coast and 1/3 of the workforce there are children, 1/5th of all cocoa is grown by children. Out of every 10 squares of chocolate you eat, 2 are the product of child labour. In 2005 many US chocolate companies signed the Harkin-Engel protocol committing to ending the worst forms of child labour. However, this protocol is non-binding and little has changed. As of 2015, many of the world's largest chocolate companies are currently facing lawsuits for turning a blind eye to these issues. Who would want to support all that??!! The good news is, you don't have to! You can, instead, choose to only buy fairly traded cocoa, chocolate and other cocoa products. The more consumers who make this choice, the fewer children will be enslaved and the more farmers will receive sufficient wages to be able to afford to send their kids to school. Whenever you buy anything with cocoa in it, check the label: if it's marked UTZ, Fairtrade or WFTO it's fine*. Cocoa grown in Samoa is also fine: perhaps uniquely amongst cocoa growing countries, child labour, forced labour and the unsafe use of agrochemicals do not appear to occur in the cocoa industry there. To help you find such products, I've compiled a list of fairly traded cocoa products currently available in New Zealand. Trade Aid products (which are all WFTO-certified) are mostly sold in their own shops (including their online shop). Many of the other products are widely available in supermarkets, although some are limited to more up-market supermarkets or health food shops. With a a bit of looking, you should be able to find more or less everything your heart desires! 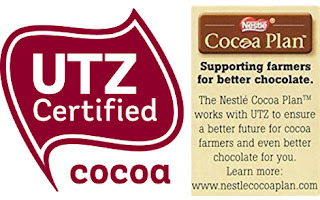 * You can read my comparison of Fairtrade and UTZ certification here. The standards certified by WFTO are very similar to those for Fairtrade International, although the organisational structure required is very different. Trade Aid chooses to certify through WFTO in part as the bulk of their products are hand crafts and Fairtrade International do not currently have standards for those. Note that only the 'milk' chocolate of the Plamil range appears to be UTZ-certified, although this year (2018) one of their Easter eggs is Fairtrade certified. Note: Nestle milky bars (i.e. their white chocolate) bizarrely don't contain cocoa butter, so you can buy them without worrying about the ethics of the cocoa supply chain. They taste fine, too :-) As well as plain milky bars, they also do one with toasted coconut and one with cookies in it: don't buy the one with cookies - the cookies aren't made with fairly traded cocoa. Devonport Chocolates (Fairtrade) - comes in dark, classic and spicy variants. milo products other than actual milo powder (e.g. their cereal and muesli bars) don't use fairly traded cocoa. Devonport Chocolates products other that their cocoa powder and hot chocolate also don't use fairly traded cocoa. Little Island chocolate coconut milk (Fairtrade). LUSH - WHERE MARKED (Fairtrade). LUSH sell a range of bath, body, face and hair products, many of which contain cocoa butter. Always check the ingredients list: if the cocoa is fair trade it will say so after the ingredient name, if it doesn't it isn't. Most of their cocoa butter is fair trade but the cocoa butter in 2-3 products isn't; none of the other cocoa products they use (e.g. cocoa powder) are currently fair trade. The cocoa butter in three products comes from the incredible Comunidad de Paz de San José de Apartadó: check them out - I was humbled to read of their commitment to peace-making in very difficult circumstances and would love to support them. Search for your nearest LUSH store here.